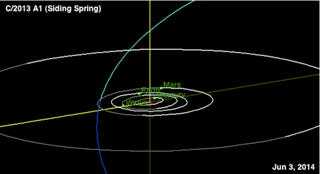 Comet Siding Spring is headed towards Mars. Not to worry, though. With its projected trajectory having it miss Mars by 84,000 miles, the comet is unlikely to make much of an impact on the red planet — but its dust might. The comet is surrounding by a dust cloud right now measuring over 12,000 miles with particles moving at a velocity of 125,000 miles per hour. 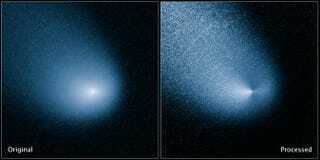 As the comet gets closer to the sun and heats up, the dust cloud will become even more active. The Hubble snagged the recent shot above of the comet as it hurtled through space which, after processing, revealed two streams of dust jetting off of the comet in opposite directions. This is good news for astronomers who can use that information to tell us more about how the comet and its cloud of dust are moving — and just how that cloud might effect the planet itself and Mars orbiting spacecraft. As you can see from this map of its trajectory, the comet won't be coming close enough to our own orbit that we'll catch a glimpse — although when the comet makes its nearest pass on October 19th, the view from Mars is likely to be spectacular.